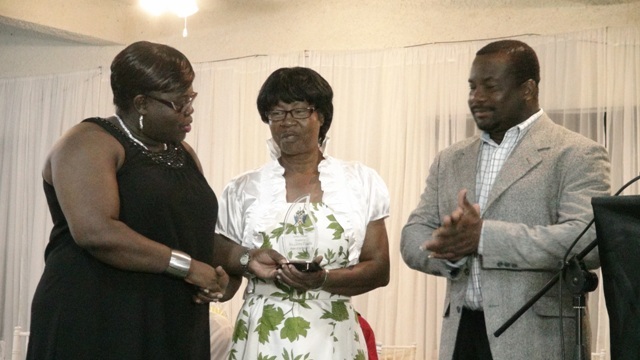 NIA CHARLESTOWN NEVIS (OCTOBER 29, 2015) — Junior Minister in the Ministry of Social Development Hon. 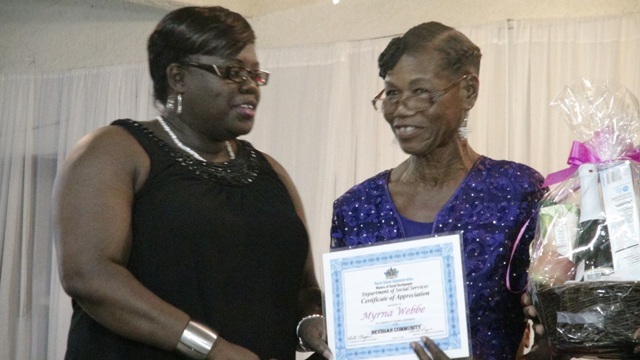 Hazel Brandy-Williams lauded honourees at the 3rdAnnual Seniors Gala and Awards Ceremony for what she described as their outstanding contributions to the development of the island of Nevis. “Through your dedication to serve, protect and preserve this our beloved land we the younger generation have a solid foundation on which we can continue to build. As trailblazers, I wish to salute you and say thanks for a job well done,” she said. 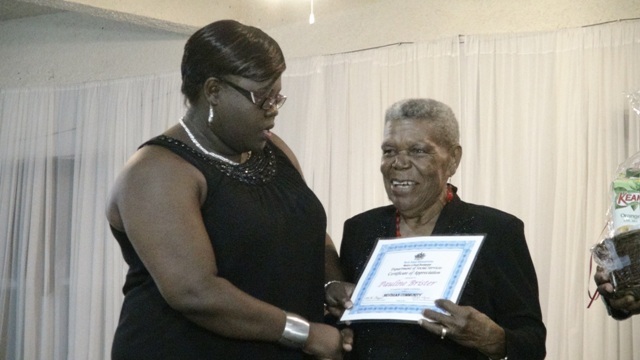 The honourees were Mr. Winston Hanley, Mrs. Florence “Ella” Merchant, Ms. Lorna Doras, Mrs. Pauline Brister and Nurse Myrna Webbe. 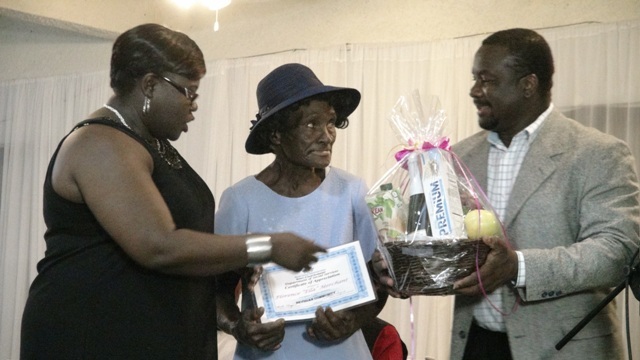 The Award for Worker of the Year 2015 in the Seniors’ Division was presented to Glorita Vaughn while awards for Nevis Seniors Fun and Action Games 2015 Top Male and Female participants were presented to Charles Othello and Sarah Browne, respectively. 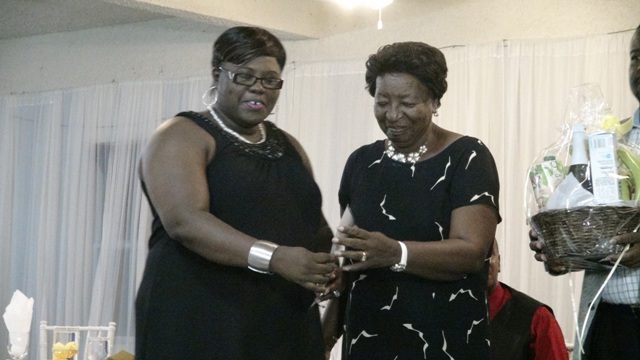 Minister Brandy-Williams also told them that it is her belief that all seniors should be treated fairly, respected and allowed to live a life of dignity. She said that is the reason the ministry and department continue to laud the seniors’ achievements in agriculture, health and community service among others, to give them their proverbial flowers while they are alive to enjoy them and to let them know that their contributions to nation building are not unnoticed. Referring to the range of activities that were held, Minister Brandy-Williams said it is evident that they encompassed what the theme embodies. She explained that the NIA has been finding ways to make the seniors’ golden years comfortable and enjoyable and the newest initiative of free bus passes was designed to give the seniors greater access to mobility. “It is hoped that you will use this as an opportunity to get out of your homes a bit more, and use this time to visit friends and families or simply to come and walk around town; sit at the waterfront and enjoy the fresh sea breeze,” the Jr. Minister said. She also mentioned the success of the first Nevis seniors Fun and Action Games. Meantime, the Minister told the seniors at the gala that it is never too late to fulfil their dreams. She said the sky is the limit, now is their time to shine, to enjoy the things they wished for while they were raising their families. According to Mrs. Brandy- Williams, the Ministry of Social Development and the administration stand committed and will continue to encourage and support them in their endeavours. The Minister also used the opportunity to urge family members of the island’s seniors to give love, support, spend time with, sit with, share and learn from them because they are great sources of knowledge and wisdom. She told the youth that they, too, should get to know the seniors, get attached to them and seek them out to be their mentors since they have trod the roads they were on before and have left foot prints as guides for all to follow. The Junior Minister also expressed gratitude to the staff of the Seniors Division, who she said ably planned and executed the month of activities. She also thanked those who forged partnerships with the division for their contributions to the activities during the month.